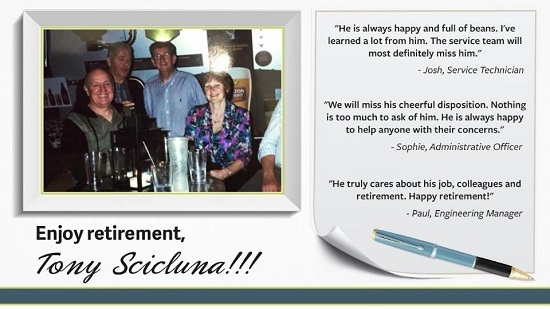 March 2015 - After servicing more than 15 years, Tony Scicluna, technical salesperson of Pneuvay Engineering is retiring from his post. He is in-charge of Technical Sales, invoicing, quoting, job costing and other customer oriented services. "Pneuvay will always be a part of me. I've met and known many great people here and will continue to stay in touch," Tony exclaimed. When asked about his retirement plan he excitedly answered, "I plan to travel around Australia with the family. It's a big, big, big continent and I believe it's more than enough to keep me busy." The staff, technicians and engineers expressed their admiration and cheerful gratitude for the professionalism Tony displayed these past 15 years. Let the relaxation begin. Happy retirement Tony! Pneuvay Engineering and its customers appreciate the care Tony showed for his job. We look forward in seeing his pictures from around Australia and the amazing stories he has to tell.